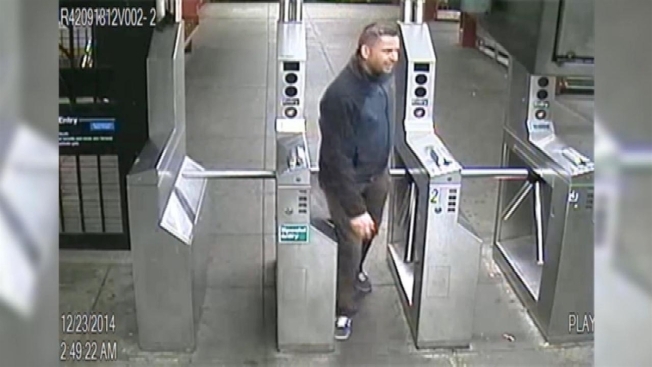 An NYPD officer is in police custody in connection with an attack last week on an MTA employee on a Bronx subway platform, police said. Officer Mirjan Lolja turned himself in Thursday at the 25th precinct in East Harlem where he is stationed. No charges have been filed yet. Lolja, who was off duty at the time of the attack, has been suspended from the force pending an investigation by the NYPD's Internal Affairs unit, police said. The 28-year-old transit worker told investigators that she was attacked at about 2:30 a.m. Dec. 23 by a man on the D train platform at the East Tremont Station. The man grabbed her from behind and pushed her to the floor, where he choked her before fleeing. Surveillance video captured the suspect leaving the station after the attack. The victim, who was wearing her MTA uniform and on duty at the time, was treated at an area hospital for minor injuries to her head, neck and back.